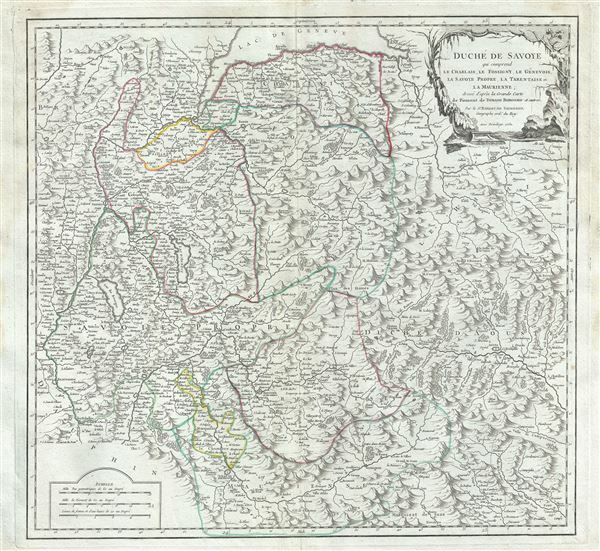 Duche de Savoye qui comprend le Chablais, le Fossigny, le Genevois, la Savoye Propre, la Tarentaise et la Maurienne; dresse d'apres la Grande Carte de Piemont de Tomaso Borgomo (i.e., Borgonio) et autres. This is a beautiful 1751 map of the Duchy of Savoy by Rober de Vaugondy. It covers from Vevey in Switzerland south to Valloire, France and from Nantua east as far as Chatillon in the Aosta Valley of Italy. The map renders the entire region in extraordinary detail offering both topographical and political information with forests and mountains beautifully rendered in profile. It depicts the Savoie wine region of France, popular for its rare white wines from grapes unique to this region. These include the Chignin Bergeron wines, made from grapes from the Montmelian and Chignin regions, in the southwest quadrant of the map and the Pinot Gris and Pinot Noir wines. The map includes a beautifully engraved title cartouche in the top right quadrant. This map was drawn by Robert de Vaugondy in 1752 and published in the 1757 issue of his Atlas Universal. Rumsey 3353.083. Pedley, Mary Sponberg Belle et Utile: The Work of the Robert de Vaugondy Family of Mapmakers, 333, state 3.